A basic sweatshirt, more often than not grey, is one of my go to wardrobe items. I've got several different varieties, and will never turn down another one as I wear them so often. I wore a grey sweatshirt for our engagement photoshoot a few years ago, and most recently bought my current favourite from Nor-Folk. The other day in H&M, I picked up a plain mid-blue one (this one maybe - but they don't seem to have the blue anymore) after almost buying the grey one then deciding maybe I should branch out and get a different colour! It's been sat in the drawer for a few weeks and I haven't worn it. 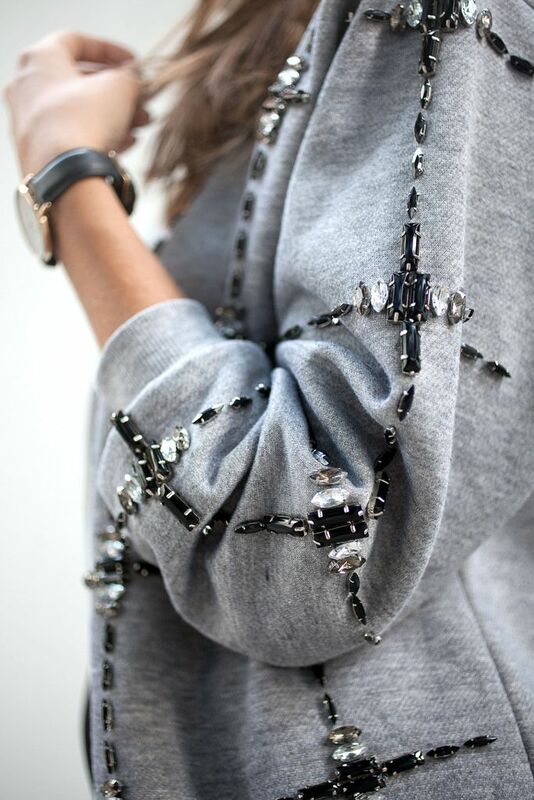 Earlier this week I was looking through my 'make' pinterest board looking for ideas for what to make next, and noticed I had pinned quite a lot of re-fashioned sweatshirts. You may remember (if you follow my instagram feed) last year I braided the cords of a plain hoodie (also an H&M basic) so I'm thinking my blue sweatshirt might get similar treatment! Contrast fabric pocket - from OASAP, sold out but easy to DIY! 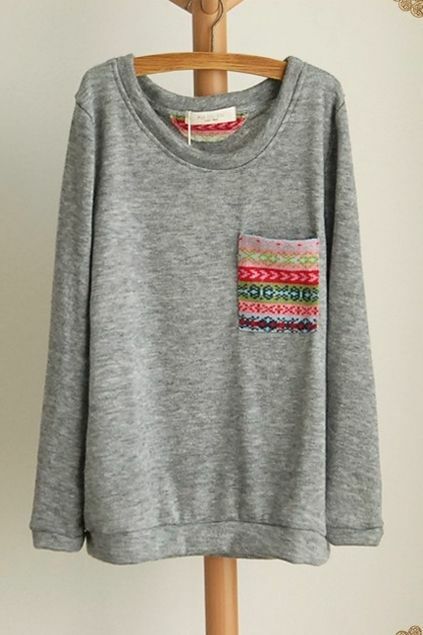 Cut off cropped sweatshirt - from Brandy Melville (appears to be sold out but this one is similar.) 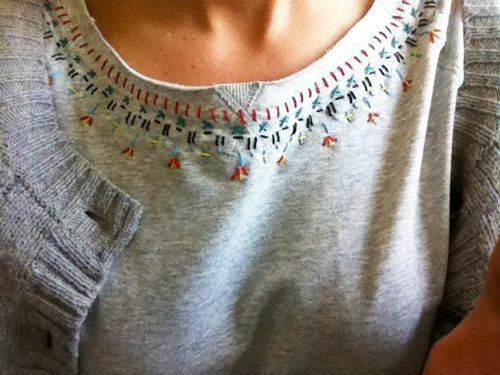 This could be a cute DIY for one of those vintage sweatshirts they always have rails and rails of in places like Rokit. 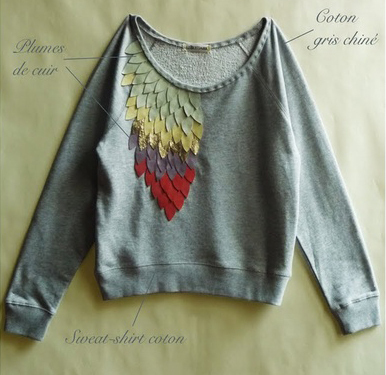 This genius transformation from A Pair and A Spare turns a simple sweatshirt into a bomber jacket! I'm not crazy about the amount of embellishment, but I do like the shape thats created. 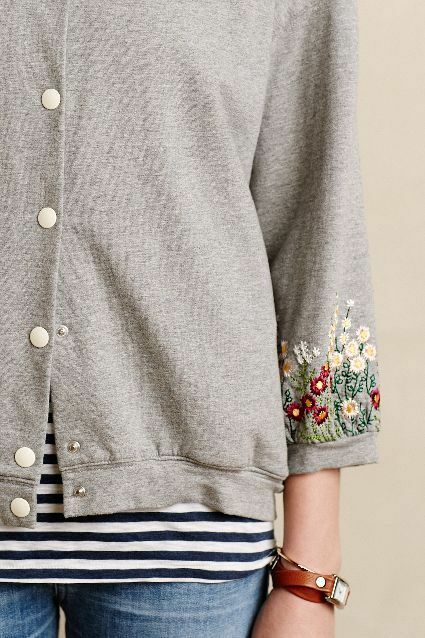 This Embroidered Sleeve Sweatshirt Jacket is from my beloved (and oh so pricey) Anthropologie, but with some patient stitching and the beginning of A Pair and Spare's bomber jacket tutorial above, I reckon you could make something pretty blooming close! Lastly is this watercolour number from P.S - I Made This. It won't work so well on my blue sweatshirt, but it's one of my favourites, and I definitely want to get some watercolour fabric dyes...I'm thinking pillowcases, or napkins, or maybe even curtains? I'm thinking some sort of embroidery is the way to go with mine (although I do have some gold faux leather waiting to be used for something too) I'm not sure whether to go for a more considered look and embroider some floral patterns across the shoulders, or just wing it with some geometric patterns and hopefully end up with something similar to the Tambouille example above. 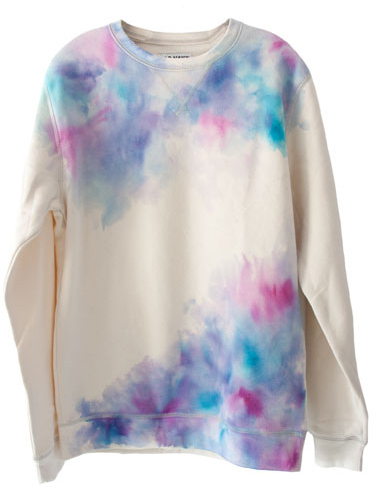 Or of course failing that, I might just go back to H&M and buy 10 sweatshirts and do them all! You are looking so glamorous in this dressing style, I love to wear these combination, it is really suit on everyone which is rough and tough. You can also buy so many collection of Willam Belli shirt at best price.